or enter code at checkout. We are happy to announce that we no longer use palm oil in the manufacture of our soaps. The harvesting of palm has a significant ecological impact on the rain forest and we feel it is an important ethical choice to make this change. Coconut, Soy, Rice Bran and Olive oils are used as the base for all our regular varieties. 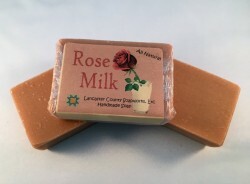 Our soaps are all about 4 ounces - 2 x 3 x 1.25". 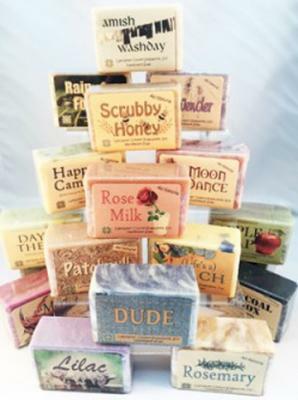 Soaps marked EO are scented with essential oils only. 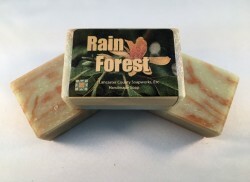 We have looked and sniffed for years trying to find a true orange scent for our soap. This one is like ripping into a fresh orange, smelling those oils as they fly from the peel! We colored it a vibrant orange and swirled with a scarlet mica for a real sunrise look! A hot pink color with a great, slightly mysterious rosy scent and a Victorian feel! You will truly take the time to smell the roses! Green, Green, Green - plus the floral note contributed by Champaca turns your shower into a waterfall in a tropical jungle. We fell in love with this fragrance and had to add it to our line. Pale green with copper tendrils! 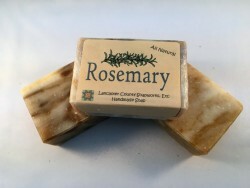 Pure rosemary essential oil scents this all natural soap. A white base, with golden swirls of, you guessed it, powdered rosemary. Rosemary is said to restore youth, aid the memory and attract fairies. How can you go wrong? Formerly called "Honey n Oats," we renamed this wonderful bar because it is just a lot more charming than it sounded! Lovely homespun bars filled with real honey, a rich emollient, and fine oatmeal. A mild cleansing and exfoliating food for the face and the whole body. 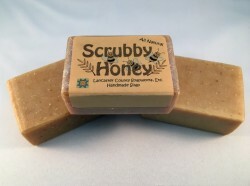 This bar is unscented except for the natural warm scents of honey and oatmeal. Living on a Christmas tree farm, we live with and love this scent all year around. It says fresh evergreens to us and is especially nice around the winter holidays. We made it for a special order and just loved it so much we decided to keep it and make it part of our regular line. 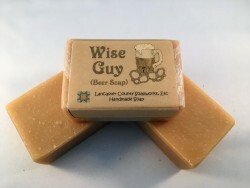 This soap is really made using beer as the liquid instead of water. We knew men would like it, but women love its creamy lather and fabulous outdoorsy scent - a great combination of cedar, sage and sweet grass. Not just for women. 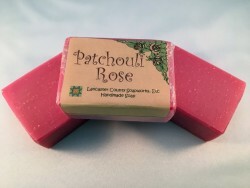 A deep fuschia soap with our own exclusive blend of essential oils. A perennial favorite. We've been making this soap since day one. A top seller.